Keep items secretly safe without cutting a hole in a novel with these Book Safes. 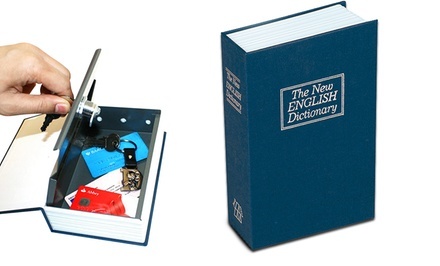 Providing an inconspicuous design for stashing stuffs, the Book Safes boast a sturdy construction and English dictionary cover design to trick snooping burglars. This dictionary doesn't contain the definition of a single multisyllabic word. Instead, it safeguards your most valuable possessions inside its hidden lock box. This cleverly disguised safe dissuades robbers with its nondescript cover and realistic pages, and it only reveals your money, jewelry, and award-winning chili recipes with the turn of one of two included keys.